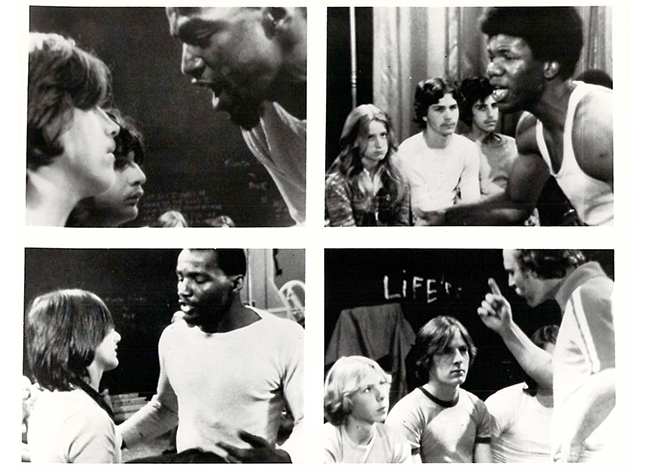 From Arnold Shapiro’s 1978 film Scared Straight! It's been said that if you do what you love, you'll never work a day in your life. Not that you'll be unemployed, but work won't seem like work as you lose yourself in pursuit of your passions. In the case of Arnold Shapiro, the 2012 IDA Career Achievement Award winner, he's been doing what he loves — making films and television shows — since 1964. And he's still going strong with a new series about to air: I Forgive You on GMC. To be successful in television, Shapiro says, "It has to be an obsession. It has to be the majority of your life and you have to want it obsessively, like a ballet dancer or musician, with this type of pursuit. You sign up for a much more enveloping life choice than being a car salesman." This single-minded focus pushed Shapiro to produce 29 series, four television movies and 90 primetime documentary and reality specials. This body of work has earned more than 150 awards, including an Academy Award, 16 Emmy Awards, a George Foster Peabody Award, three Humanitas Prizes, the People's Choice Award and now this honor from the IDA. Shapiro has produced programs for every broadcast network and 14 cable channels, "from MTV to HBO," he says. The subject of his 1978 breakthrough hit, Scared Straight!, came to him from an article in the now-defunct Reader's Digest. The piece described a program at Rahway State Prison, a maximum security facility in New Jersey, where "at-risk kids learn about life in prison from prisoners," says Shapiro. This wasn't some nice lecture series and tour of the prison. Instead, a group of tough, foul-mouthed convicts confronted the young offenders in a three-hour, "non-stop session of harassment," as they laid out exactly what it meant to be in prison. The goal was to keep the kids out of prison by literally scaring them straight. This story had all the elements of a good film, and Shapiro called the prison to see about bringing in a crew to record a session. The prison agreed, but now he had to sell it to his management at Golden West Broadcasting, where he was working at the time. Gene Autry, "America's Favorite Singing Cowboy," owned Golden West, and he promoted clean-cut, clean-language programming that adhered to the "Cowboy Code" that he embraced. Two of the cardinal rules of the code were that you had to be "gentle with children" and "clean in speech," meaning that Shapiro's idea should have been a goner. "I told management that if I bleeped out all the profanity, the audience wouldn't understand what they said," Shapiro recalls. Golden West gave him the go-ahead to shoot the program, but when it was done, he'd have to get it approved by Autry. Shapiro went to New Jersey, and after filming the non-stop harassment sessions, he "came out with the worst headache he'd ever had." But he also had the makings of a great film. The real hurdle was getting Autry on board. His first reaction, according to Shapiro, was, "You want to put that on my station?" Shapiro responded yes, arguing that "The real obscenity is not the language, but juvenile crime—and this film is addressing these issues." Autry relented, and his local Los Angeles station, KTTV, aired Scared Straight!, at 10:00 p.m. on a Thursday night. The program earned higher ratings than competing shows on the CBS, NBC and ABC affiliates. Other stations across the country took notice, and Shapiro eventually secured a national syndication deal for his controversial program. But it didn't end there. He was also offered a TV movie from CBS—"not a development deal," says Shapiro, but a project that went straight from script to production. He received calls from celebrities like Henry Winkler and Paul Newman, who wanted to know what they could do to help get the Scared Straight! message out. Shapiro soon had deals in place for Scared Straight! to air in almost every major city. And letters poured in from "people who said it changed their lives," according to the producer. The success of Scared Straight! kept building, and earned him an Academy Award for Documentary Feature in 1979, as well as Emmy Awards for Outstanding Individual Achievement—Informational Program and Outstanding Informational Program. The film also put him on the map as a producer who could deliver a big audience with a serious, nonfiction work airing on primetime. This gave him the ability to get in the door and pitch an idea that others would shy away from. In the early 1990s, Shapiro used his leverage to break another taboo subject with his film Scared Silent: Exposing and Ending Child Abuse. Oprah Winfrey agreed to host this special, which he was able to convince three networks (CBS, NBC and PBS) to air simultaneously. But ABC balked at first, since the broadcast would have to bump Monday Night Football. Winfrey broached the subject with ABC's owner, and the network agreed to air Scared Silent later in the week. This program not only broke new ground by talking about the subject of child abuse, but, according to Shapiro, it was also the highest rated non-news documentary special ever to be broadcast on television in the United States. Scared Silent also led to a follow-up program, Break the Silence: Kids against Child Abuse, which was honored with a George Foster Peabody Award. Both specials triggered an avalanche of phone calls and letters from those who'd been abused—and even from some abusers who wanted to get help. Producing these powerful programs has given Shapiro a standing among broadcasters and his fellow filmmakers that is unique. He has also proved that these shows have legs. Scared Straight! was revived in 2010 as a series on A&E called Beyond Scared Straight, and has resulted in 45 one-hour documentaries that depict "the harsh realities of prison and jail life." While Shapiro has also produced fiction films, documentaries are dear to his heart. In fact, he is one of the original members of the International Documentary Association; IDA Founder Linda Buzzell had approached him while they were both working for legendary television producer David Wolper. When Shapiro was growing up in Los Angeles, his family was the first in his neighborhood to own a television, and he was inspired by the documentaries that aired in primetime: CBS Reports, NBC White Paper, Victory at Sea and more. These programs spurred him to take his father's 8mm camera and start producing films as a teenager in the 1950s. He knew this is what he wanted to do, but he didn't know he was going to impact so many people with his talent, his gift for storytelling and his big heart. Shapiro attributes his success to having been "surrounded by many talented, hard-working, dedicated and wonderful women and men working in the television industry." He changed television, and he changed lives. Documentaries, especially those made by Arnold Shapiro, can indeed make a difference. Michael Rose is an author, journalist, writer/producer/director who's created over 200 nonfiction television shows.